Next stop was Michelle Marvig’s Patchwork Heart which I mentioned here. I had previously purchased some of her Souzani range when she visited the Camden Country Quilters’ Guild but she didn’t have the colourway I really liked with her so this was an opportunity to get some. I think it looks lovely in this bluey turquoise. She also had laminated fabric in this design and I almost succumbed – perhaps when I’ve completed a few of my “works-in-progress”. Patchwork Heart was also having a sale with between 30% and 50% off fabrics so I bought a small selection of fabrics I hadn’t seen anywhere else – couple of reds and a grey and a green. They also had the most comprehensive selection of Perle 8 threads I’ve ever seen. I bought a lovely purple one and lurid pink one for my granddaughter to use when she comes to visit. Purple and pink are her favourite colours and I’m hoping to teach her some embroidery using this very clever kit which I bought online. 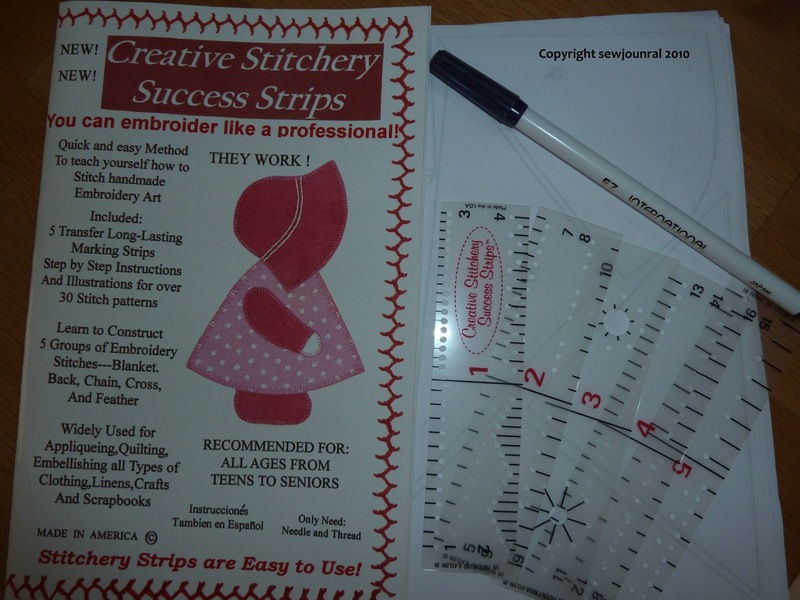 It uses rulers with holes in and allows you to mark with a pen (included) where the needle needs to go in and out of the fabric. Last night I went to the Camden Quilters’ Guild where Michelle Marvig came to tell us about the quilting tours she had hosted through the US, Europe and Britain. Her photo albums were wonderful. I particularly liked the ones taken at The European Patchwork Meeting which is hosted in four picturesque Alsatian villages. Michelle has her own shop called Patchwork Heart and you can see the whole Suzani range online here.